This is the translation of the15 July 2011 testimony of Fatemeh Farhoudi, mother of Mohammad Khosh Sorour, detained Iranian asylum-seeker in Larnaca, Cyprus, regarding the armed assault on unarmed detained Iranian asylum-seekers by Cypriot prison authorities in the wake of the 12 July 2011 explosion of Islamic Republic of Iran’s munitions cargo intercepted by Cyprus. The scan of the original Farsi letter is embedded below. The letter was provided via the Cyprus Refugee Rights Movement; translation to English by Mission Free Iran. We encourage people to participate in the letter-writing action that appears below the embedded scan. I, Fatemeh Farhoudi, daughter of Hassan, born in Tehran in the year 1345 [1966-67], passport # 14821293, mother of Mohammad Khosh Sorour, after 3 days of trying, finally succeeded today, Friday, 15th July 2011 at 12:30, in visiting my son in person for 15 minutes at Famagusta detention in Larnaca. According to the information that my son, Mohammad Khosh Sorour gave me verbally, he was attacked and beaten by 30 prison officers and CID, ordered by the chief of the Larnaca prison Mr. Galou Girou. They used brass knuckles, batons, and their guns [to pistol-whip, not discharged]. My son was injured on his back, face, and neck, and according to him, everyone has been beaten this way. These people are 1) Mr. B., 2) Mr. O., 3) Mostafa Taghilou, and a person from Syria. Mr. Taghilou has suffered a broken leg. He has not been allowed to go to the hospital. All of the personal belongings of these people, including bedsheets, medicine, and food, have been confiscated. They have been told, “You deserve to live like dogs.” They were ordered not to tell anyone that they have been beaten, and they were threatened to be killed if they talk about the beatings. I, Fatemeh Farhoudi, ask all humanitarian organizations, governments, churches, Red Cross, and the International Court, to attend to this urgent, sad, and at the same time important issue. Translation by Ahmad Fatemi and Maria Rohaly, Mission Free Iran. We ask concerned people to write to the International Red Cross, UNHCR, EU, and foreign ministries regarding this crime against Iranian refugees in Cyprus. Email addresses and webform links appear below the sample letter. 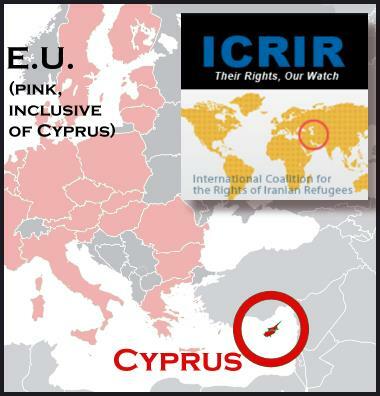 The Cypriot government’s ongoing, well-documented abuse of refugees, asylum-seekers, and immigrants has now culminated in a brutal attack on defenseless detained Iranian refugees by armed Cypriot authorities in Larnaca detention center on 12 July 2011. This is criminal and it is simply unacceptable at any level, no less for a country that is a member of the European Union. I demand immediate investigation of prison and detention conditions in Cyprus by the International Red Cross. Further, UNHCR must confer immediate protection on those attacked and ensure their rapid resettlement to a safe third country, as they clearly have basis for fearing political persecution by the Cypriot government. Finally, I demand that the Cypriot government be held accountable immediately at level of the European Union, and a case against the government of Cyprus should be brought directly at the level of the EU Court of Human Rights.